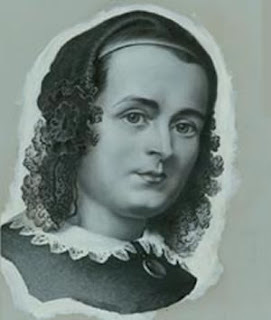 This day in 1808 was the birthday of Caroline Chisholm, an English gentlewoman who arrived in Sydney, Australia with her husband and children in 1838. She was horrified at the conditions of many of the migrants – particularly the women – and immediately set about addressing the problems. She set up many projects and became famous as ‘the emigrants friend’, meeting every migrant ship and making sure that the single women were safely accommodated and assisted to find work (or husbands, which is the same thing, really). Caroline wrote several tracts to advise potential migrants, and in one of them she discussed the trials and tribulations of ‘bush cookery’. Early settlers were lured to Australia with the phrase “Meat three times a day” – and the meat was usually salt beef (‘corned beef’). Caroline described how to meet the challenge of preparing the same meat every night of the week – and keeping the husband happy. "The great art of bush-cookery consists in giving a variety out of salt beef and flour, minus mustard, pepper, and potatoes. Now, the first thing that a wife has to do in the bush is examine the rations, and think and contrive how to use them. Every woman who values her husband’s health and comfort will give him a hot meal every day. Monday. Cut the meat into small pieces; put them in the frying pan to stew; throw away the first water, then shake some flour over the meat and when sufficiently done, turn it out upon a dish; then take the remainder of this day’s flour (for you should be very particular and have no guess-work), mix it with water, not too much, and make it into a pancake. When fired, put the stew on top of it, and this will prevent any loss of gravy; keep it hot until your husband comes home, and he will have a palatable dish called ‘The Queen’s Nightcap’. Thursday. Boil your beef, and make your flour into dumplings. Friday. Beefsteak pudding; if Catholic, fish for your dinner. ‘Tis all in the name, apparently. * Damper stories are HERE and HERE. There is no doubt that Henry D. Thoreau was a marvellous observer of life in the woods. As for his observations on humankind, I am not qualified to answer, but his journal entry on this day in 1857 suggests that he was capable of being quite judgemental. And I don’t just mean about farmers’ boys. The consummate snobbery aside, this statement begs a number of other questions. - and perhaps that coarse-natured boys would probably not like acidic pickles, on account of their unsophisticated and indelicate tastebuds. I read into it also that he feels that a variety of apple which is particularly good for baking is intrinsically inferior to one that is good for eating out of hand. But perhaps I am being hard on Mr. Thoreau. Apparently the apple goes by a number of names, most referring to either the pumpkin connection or the sweetness. Modern references mention it as having a firm yellow, crisp, juicy, and very sweet flesh - which makes it sound like the perfect eating apple, but I await some informed opinion from my American readers. The Pumpkin Sweeting is said to have a particular affinity with quinces, and to make good apple butter. It does both in this recipe. You could make the cider for the recipe with them too, if you have a good supply. Boil down new sweet cider to one half the original quantity. Stew peeled and cored apples, with one quarter as many quinces, in this cider, till it is a very dark color. If well boiled, it will keep a year in jars, and is called Apple Butter. Adam was but human-this explains it all. He did not want the apple for the apple's sake, he wanted it only because it was forbidden. Mark Twain. On this day in 1941, the British wartime Minister of Food, Lord Woolton, announced experimental egg rationing. The British accepted rationing with typical British stoicism – but the dried egg powder introduced in 1942 was utterly despised. It sounded good, if you believed the Ministry of Food’s spiel that dried eggs were "pure fresh eggs with no additions, and nothing but the moisture taken away." One level tablespoon of dried egg mixed with two level tablespoons of water was equal to one egg. The Ministry of Food tried, and the valiant Britons tried, but no matter how it was done, dried eggs may have been OK in baking, but they were not OK on the breakfast plate. A tablespoon of powder may have been Equal to one egg, but it was not The Same as one egg. Scrambled Egg, using Egg Powder. 1 egg reconstituted (mixed with water), 0.5 of an ounce of fat and 1 tablespoon of milk. Melt the fat in a pan, beat the egg and milk together, add to the fat in the pan, season well and cook over a gentle heat. Diced cooked vegetables could be added for flavour. There are other dried egg recipe stories HERE, HERE, and HERE. There are entire nations that have never learned how to scramble eggs. One has only to travel in Great Britain. Jon Carroll. Cookery is a constantly evolving and adapting art and science, and it can be difficult if not impossible to determine the roots of many dishes – even the fiercely national ones. Most dishes are like mongrel dogs, with a little bit of a lot of influence. Often the Anglicised names of dishes are a clue. There must be twenty different spellings of ‘pilau’ in old English cookbooks, for example. Sometimes a recipe would simply be designated ‘in the Spanish style’, or ‘the French way’, or ‘Italian fashion’. By the nineteenth century, a few cookbooks started to appear that proudly demonstrated and promoted ‘foreign’ food. A ‘coulibiac’ is, according to the OED ‘A Russian pie of fish or meat, cabbage, etc.’ The cabbage appears again, I see – which is ironic as this post arose out of my need to balance Pushkin’s ‘national monotonous diet’ idea. Here are a couple of ‘Russian pies’ à la English-language cookbooks - one simply named, the other accurately enough. Both without cabbage. Chop some cooked trout and white fish, and mix with ½ cup of boiled rice. Season with salt, pepper and all kinds of herbs minced fine. Then make a rich pie-paste and roll out very thin. Fill with the mixture and make into a roll. Sprinkle with bits of butter and let bake until brown. Serve hot with wine-sauce. Make a paste as for baba pudding or Savarin, and roll it very thin. Cut into a large square, fill it with a forcemeat of veal, rice, eggs, herbs, butter, stock, and mushrooms, and roll it up like jelly cake. Dust the top with crumbs, and bake it 1 hour. Serve with hot wine sauce, in slices. Tomatoes and oregano make it Italian; wine and tarragon make it French. Sour cream makes it Russian; lemon and cinnamon make it Greek. Soy sauce makes it Chinese; garlic makes it good. Alice May Brock. My knowledge of Russian cuisine is next to nothing, and I certainly cannot read Russian, so his statement ‘Cabbage soup and barley. They’re Russia’s national food. Both excellent in their way, but a shade monotonous’ had me interested. Surely it is a sweeping generalisation? It would be expected perhaps from a man committed as he was to social reform - the two items reflecting the daily food of the poor folk, not the elegant tables of the rich and famous. Breakfast: Kasha, brown bread, tea and some sugar. Lunch: Cabbage soup, mashed potatoes, bread. Supper: Fish soup and bread. Thankfully, to fulfil our requirement of a recipe a day, another visitor described the method of making cabbage and barley soup – and includes the enrichments of the rich, proving that it was not solely fuel for the poor. The cabbage-soup (shtshee) is the favourite national dish, and is variously prepared. Six or seven cabbages, chopped up, half a pound of barley-meal, a quarter of a pound of butter, a couple of pounds of mutton cut up, and a handful of salt, stewed in two cans of kwass, make an ordinary mess. The very poor omit the butter and mutton; the richer classes substitute broth for kwass, and enrich the dish with cream and other ingredients. I may not be able to read Russian, but I am not fooled by the reports of these visitors, who must surely have suffered from ethnic-blindness. Why did they not mention Coulibiac? Piroschki? Caviar? Blinis? …….. ? I would rather live in Russia on black bread and vodka than in the United States at the best hotels. America knows nothing of food, love or art. Isadora Duncan. A throw-away phrase in a throw-away magazine a week or two ago determined me to consider astrological influences in relation to our foods. I find it impossible, personally, to believe that the movement of the planets affects my dinner, although part of me would very much like to believe it. Some of us, some of the time, need a reminder of our cosmic insignificance – and I am not thinking just of politicians here. Alas! I am too firmly fixed in my interest in the scientific evidence for life, the universe, and every damn edible thing in it, and I find there is insufficient to make me change my eating to fit my star-sign (Capricorn, in case you are interested). Our ancestors of course considered the available evidence, and developed – as we do – incontrovertible proofs and rational applications of all sorts of things. Also like us, they disagreed. He gives much more medical detail, I just picked out the bits that intrigued me. I am in the medical business myself, and in a far-more serpent ridden country that Nicholas, but have to say, even here, that we don’t frequently need serpent-bite remedies. I am not certain in any case that fennel would be sufficiently powerful against a nip from a red-bellied black snake. Dr Culpeper need not have feared for the loss of the ‘old fashioned’ and astrologically correct method of cooking fish with fennel; it was still regularly appearing in cookbooks a hundred years later. Fillets of mackerel, with fennel and gooseberries. For this the French always boil their mackerel as we do, only adding a little vinegar and a bunch of herbs, take the sides or fillets from the bone, and cut in two pieces ; about four is enough for fuch a dish as here proposed, put them into a stew-pan with the melts and roes whole, dash in a glass of white wine, a ladle of cullis and gravy, some minced fennel, green onion and parsley, pepper, salt and nutmeg ; stew all about eight or ten minutes ; put in about half a pint of scalded young gooseberries whole, squeeze in a lemon or orange, andd ferve it up hot. The painter Vincent van Gough kept up a long correspondence with his brother Theo, who supported him financially. As we well know, Vincent ‘went mad’, cut off his ear, and ended up in an asylum at Saint-Rémy. He wrote to his brother from there on this day in 1889. “The food all right as far as it goes. It tastes a bit musty, of course, as in a cockroach-infested restaurant in Paris, or in a boarding-house. The poor wretches here, having absolutely nothing to do (not a book, nothing more to distract them than a game of boules or a game of draughts), have no other daily distraction than to stuff themselves with chickpeas, haricot beans, lentils and other groceries and colonial produce, in set quantities and at stated hours. As the digestion of these foodstuffs offers certain difficulties, they fill their days in a way as offensive as it is cheap”. In other words, beans are fart food – perfect for a little offensive fun in the asylum or elsewhere. I don’t know of any scientific studies to back this up, but there is a widespread belief that lentils are the least likely of the dried pulses to offend in this way. Sometimes our received wisdom is not very wise after all, so I would not be surprised to find that this is not at all true. Much is written about the lentil, but almost none of it tells a story, which is a waste of writing in my opinion. Unless the story is about uncertainty of purpose. There is no consensus on what the poor lentil is supposed to do with its life. Is is merely Lenten food? Lentils are much used in Lent time: they bind up and qualify the too great Motion of the Humors, by their gross and earthy Juice, which thickens the Liquors, and gives them a greater Consistence than before. The Pharmacopoeia Universalis: Or, A New Universal English Dispensatory,(1747) suggests a decoction of red beets with lentils to check a Diarrhoea. Is it fit only for animals? Suggests lentils as excellent sweet fodder for calves, and the best food for pigeons. Or is it brain food? Make a light roux, in which put some sweet herbs, or onions cut in dice; give them a few turns in the roux; to which add a little stock, or water; when well mixed, put in the lentils with salt and pepper. Serve them hot. Lentils à la maître d’hôtel. Boil some lentils in salt and water; then drain them, and put them in a saucepan, with a large piece of butter; shred parsley, some salt, and pepper; toss them in a stewpan, and serve them hot. Garnish with crusts of bread round. Another story inspired by one of Vincent’s letters is HERE. Our old friend the eighteenth century Parson James Woodforde received the ‘living’ of the parish of Weston Longeville in Norfolk in the 1770’s. And a good living it was too. Eating local was the norm in his day. The local community provided all the ingredients essential to good eating, and everything was made from scratch in the home kitchen. The parson bought such things as butcher’s meat but kept his own pigs, his tenant farmers seemed to be a productive lot, and fresh fish was not a problem. His diary entry on this day in 1778 is very revealing. How often these days are pike of over eight pounds caught in Norfolk? Or three pound trout? Someone in the know please let us know. The pike is a long fish with a long pointed (pike-shaped) jaw and big teeth – all the better to eat other fish with. They are known to be a predatory species, and from the parson’s diary it seems they are also not above a bit of cannibalism. The human prejudice against eating meat-eating animals and birds does not seem to extend to fish-eating fish. Why is that, do you think? The pike was a favourite fish from medieval times – big enough and meaty enough to cook with a big meaty stuffing in its belly, and big enough and fierce enough to look spectacular served in the traditional way – appearing to eat its own tail in the ultimate act of cannibalism. Hannah Glasse, whose book The Art of Cookery, Made Plain and Easy (1747) was very popular in the parson’s time, tells us how to cook and serve a prodigious fine specimen of a pike. GUT it, cleanse it, and make it very clean, then turn it round with the tail in the mouth, lay it in a little dish, cut toasts three-corner-ways, fill the middle with them, flour it and stick pieces of butter all over; then throw a little more flour, and send it to the oven to bake: or it will do better in a tin-oven before the fire, then you can baste it as you will. When it is done lay it in your dish, and have ready melted butter, with an anchovy dissolved in it, and a few oysters or shrimps ; and if there is any liquor in the dish it was baked in, add it to the sauce, and put in just what you fancy. Pour your sauce into the dish. Garnish it with toast about the fish, and lemon about the dish. You should have a pudding in the belly, made thus: take grated bread, two hard eggs chopped fine, half a nutmeg grated, a little lemon peel cut fine, and either the roe or liver, or both, if any, chopped fine; and if you have none, get either a piece of the liver of a cod, or the roe of any fish, mix them all together with a raw egg and a good piece of butter. Roll it up and put it in the fish’s belly before you bake it. Viscount John Byng took to the English country road in the eighteenth century for a variety of reasons, and luckily for us he kept a meticulous record of his observations. We have met him a couple of times already - once to share his horrid meal of ‘raw, rank mutton chops and some cold hard potatoes’, and another time when he fared very sumptuously on ‘Cold Beef, Cold Veal, and Gooseberry Tart’. He had another gooseberry tart experience on this day in 1789, but it was not so pleasant. The Viscount was, perhaps optimistic in expecting a pie of fresh gooseberries so early in the season? Or am I out of touch with the English seasons? Gooseberry tart was a staple in inns and ordinary households at the time because the fruit grew without much effort on the part of humans, and it lent itself well to preserving. Since late medieval times gooseberries had been used to add a sour note to rich meat and fish (it was regularly paired with mackeral), along with barberries and lemon, but by the seventeenth century was firmly employed in the pies and tarts of the country. We could digress here into a discussion of was John’s ‘tart’ really a pie, as it clearly had a lid, and some would consider it therefore a pie, but such a crucial debate takes place in my upcoming book The Pie: A Celebratory History, and redundancy is, well – redundant. Instead, we will consider the name ‘gooseberry’. A silly name. Nothing at all to do with geese, unless some long-forgotten method of force-feeding gooseberry pie instead of figs to geese to fatten their livers explains it. Even the Oxford English Dictionary gives up. They were ‘goosegogs’ to me as a child in the north of England, and in some parts they are called fea-berries, but the OED offers nothing there either. For a foolishly-named fruit the only suitable recipe is the foolishly-named fool, which is a trifling form of dessert like a trifle without the texture. Take two quarts of gooseberries, set them on the fire in about a quart of water. When they begin to simmer, turn yellow, and begin to plump, throw them into a cullender to drain the water out ; then with the back of a spoon carefully squeeze the pulp, throw the sieve into a dish, make them pretty sweet, and let them stand till they are cold. In the mean time take two quarts of new milk, and the yolks of four eggs beat up with a little grated nutmeg; stir it softly over a slow fire; when it begins to simmer, take it off, and by degrees stir it into the gooseberries. Let it sland till it is cold, and serve it up. If you make it with cream, you need not put any eggs in: and if it is not thick enough, it is only boiling more gooseberries, But that you must do as you think proper. Melt some lard, take out the mammocks; put your flowre into your melted lard, seeth it well, but have a care it stick not to the pan, mix some onion with it proportionably. When it is enough, put all with good broth, mushrums and a drop of vinegar. Then after it hath boiled with its seasoning, pass all through the strainer and put it in a pot. When you will use it, you shall set it upon warm embers for to thicken or allay your sauces. The French Cook, Francois Pierre La Varenne, 1653. I feel the need to give Ms Ephron an equally simple recipe for her birthday, although methinks she is unlikely to ever be aware of it, so we must enjoy it on her behalf. She wrote about the strange phenomenon of egg-white omelettes some time ago – a concept that I too find difficult to reconcile. By way of compensation, I offer her this extraordinarily simple eggy delight, from another Frenchman, M. Menon, from his The French Family Cook .. Adapted to the Tables not only of the Opulent, but of Persons of moderate Fortune and Condition (1793). Put a gill* of cream into a dish for table, let it boil till half is consumed; then put in eight eggs, with salt and large pepper; let them boil, and pass a salamander over them. *a gill is a quarter of a pint. My mother was a good recreational cook, but what she basically believed about cooking was that if you worked hard and prospered, someone else would do it for you. Nora Ephron. A reader has taken me to task (in the nicest possible way – thanks Sandra), for suggesting Dr Kitchener invented spice mixes. Sandra is correct of course, for spice mixes were made in medieval times, and it is unfortunate that we do not know the exact formulae for the very common mixes called powder douce and powder forte. Dr. Kitchiner was however, very serious on the subject of flavourings, and gave a huge number in The Cook’s Oracle. He has recipes for essences, quintessences, tinctures, catsups, sauces, and plain powdery mixes, and his Magazine of Taste contained spaces for a selection of twenty-eight varieties. Recipes for most of his own choices are also given in the book. Perhaps some of the choices don’t appeal to you, and you have a spare spot in your mahogany box? He has plenty to spare. Many of the essences would be equally at home in the cocktail bar and the home medicine chest. Brandy, or proof spirit, a quarter of a pint. Celery seed bruised, half an ounce, avoirdupois weight. Let it steep for a fortnight. A few drops will immediately flavour a pint of Broth, and are an excellent addition to Pease, and other Soups, and the salad mixture of Oil, Vinegar, &c.
Put half an ounce of Cayenne Pepper into half a pint of Brandy, or Wine; let it steep for a fortnight, and then pour off the clear liquor. This is nearly equal to fresh Chilli juice. Obs. – It is extremely convenient for the extempore seasoning, and finishing of Soup, Sauces, &c., its flavour being instantly, and equally diffused. Cayenne Pepper varies so much in strength, that it is impossible to season Soup any other way to the point of piquance. Two teaspoonfuls in a wine-glass if water are a present and pleasant remedy in Nervous Langours, and in relaxations of the Bowels – in the latter case, five drops of Laudanum may be added to each dose. A very easy, and economical way of obtaining, and preserving the flavour of Lemon Peel, is to fill a wide-mouthed pint bottle half full of Brandy, Rum, or proof spirit; and when you use a Lemon, pare the rind off very thin, and put it into the Brandy, &c., - in a fortnight, it will impregnate the spirit with the flavour very strongly. The lemon peel in brandy idea is the one most likely to be prepared in my own kitchen – it seems like a fine way to use the lemon zest from a lemon squeezed for another recipe. Are there any cocktail enthusiasts out there who would consider inventing a new cocktail using the Essence of Cayenne? Do let us all know if you do – and please consider naming it The Kitchener, or Doctor William, wont you? Dr. William Kitchiner and his Magazine of Taste is our inspiration for the week. It proves that spice mixes are not a new idea. It is probably fair to say that Dr. Kitchiner was the inventor of the concept in the first few decades of the nineteenth century. The box itself is an even more impressive idea and has a lot of appeal in this plastic world – in fact I would quite like one myself, if I could find someone to make it for me out of mahogany (another beautiful timber would do), with the correct number of compartments. It has not been easy to decide which recipes to include this week, but I found myself slightly intrigued by ‘Pea Powder’. I assumed it must consist of dried peas, simply pre-ground to speed up the cooking process. It is not. It is a flavouring powder (of course) with the most amazing power of suggestion. Pound together in a marble mortar half an ounce each of dried Mint and Sage, a drachm of Celery Seed, and a quarter drachm of Cayenne Pepper; rub them through a fine sieve. This gives a very savoury relish to Pea Soup, and to Watergruel, which, by its help, if the eater of it has not the most lively imagination, he may fancy he is sipping good Pease Soup. SOY, is a liquid condiment, or sauce, imported chiefly from China. It is prepared with a species of white haricots, wheat flour, common salt, and water ; in the proportions respectively of 50, 60, 50, and 250 pounds. The haricots are washed, and boiled in water till they become so soft as to yield to the fingers. They are then laid in a flat dish to cool, and kneaded along with the flour, a little of the hot water of the decoction being added from time to time. This dough is next spread an inch or an inch and a half thick upon the flat vessel (made of thin staves of bamboo), and when it becomes hot and mouldy, in two or three days, the cover is raised upon bits of stick, to give free access of air. If a rancid odor is exhaled, and the mass grows green, the process goes on well; hut if it grows black, it must be more freely exposed to the air. As soon as all the surface is covered with green mouldiness, which usually happens in eight or ten days, the Cover is removed, and the matter is placed in the sunshine for several days. When it has become as hard as a stone, it is cut into small fragments, thrown into an earthen vessel, and covered with the 250 pounds of water having the salt dissolved in it. The whole is stirred together, and the height at which the water stands is noted and the height at which the water stands is noted. The vessel being placed in the sun, its contents are stirred up every morning and evening ; and a cover is applied at night, to keep it warm and exclude rain. The more powerful the sun, the sooner the soy will be completed ; but it generally requires two or three of the hottest summer months. As the mass diminishes by evaporation, well water is added; and the digestion is continued till the salt water has dissolved the whole of the flour and the haricots ; after which the vessel is left in the sun for a few days, as the good quality of the soy depends on the completeness of the solution, which is promoted by regular stirring. When it has at length assumed an oily appearance, it is poured into bags, and strained. The clear black liquid is the soy, ready for use. It is not boiled, but is put up into bottles, which must be carefully corked. Dr Kitchiner’s Magazine of Taste - impressive as it is - contains only a small fraction of the essences, quintessences, sauce bases, and powders on his book. Tomorrow we will enjoy some of its omissions. A well made sauce will make even an elephant or a grandfather palatable. Grimod de la Reynière. Mustard, Allspice, and Black pepper ground and sifted fine, half an ounce each. Ginger, Nutmeg grated, and Salt a quarter of an ounce each. Pound them in a mortar, and pass them through a fine hair sieve : bottle them for use. The above articles will pound much easier and finer if they are dried first in a Dutch oven before a very gently fire, at a good distance fiom it: if you give them too much heat, all the finest flavour of them will be evaporated, and they will get a strong rank taste. Sounds a bit anarchic to me – allowing a lot of guests with vibrating palates to toss pea-powder into the custard, and pudding catsup into the ragout, being completely unmindful of the effort of pounding and mixing that it all required. The Magazine of Taste could also be used as a Travelling Store-Chest. Think on that next time you are looking for a gift for the campers or mobile-home owners in your family. Get out there to your shed and knock up a little mahogany box with space for twenty-eight bottles, then get back into the kitchen and start pounding and mixing. Actually, all flippancy aside, I think it would be a quite elegant gift, done properly. The individual mixes might be a fine idea for the Christmas hamper too, should you have a food-history buff in the family. Soup-Herb Powder (or Vegetable Relish). Lemon-peel, cut very thin and dried, and Sweet Basil, an ounce of each. Dry them in a warm, but not too hot Dutch oven: when quite dried, pound them in a mortar, and pass them through a double hair-sieve; put them in a bottle closely stopped, they will retain their fragrance and flavour for several months. Salad or Piquante Sauce for Cold Meat, Fish etc. Pound together an ounce of scraped Horseradish, half an ounce of Salt, a table-spoonful of made Mustard, Four drachms of minced Eschalots, half a drachm of Celery-Seed, And half ditto of Cayenne, Adding gradually a pint of Burnet, or Tarragon Vinegar and let it stand in a Jar a week, and then pass it through a sieve. The powder is mixed with water and tastes exactly like powder mixed with water. Art Buchwald, on Liquid Diets. Dr. Kitchener (yesterday’s post) could give us enough interesting material for years, but too much of a good thing keeps us away from other good things, so we will only stick with him for a week. In yesterday’s recipe, Dr. Kitchiner used ‘capillaire’ in his pudding catsup. Capillaire is not a common ingredient in the pantry these days – there is certainly a dearth of it in mine, which is otherwise well stocked. What is it? In its original incarnation, capillaire was ‘a syrup or infusion of maidenhair fern (Adiantum capillus Veneris).’ It was used for medicinal purposes for a range of problems such as pectoral complaints and pulmonary catarrhs, the King's Evil and other hard swellings, and the very inconvenient problem of hair loss. A spoonful of orange-flower water and some honey was often added to make the medicine go down more tastefully, and eventually the fern became optional and capillaire became ‘a syrup flavoured with orange-flower water’. If orange flavouring is good, then orange-flavoured alcohol must surely be better – and it was Dr. Kitchener’s choice in his version of capillaire. To a pint of Clarified Syrup add a wine-glass of Curaçoa, or dissolve a drachm of Oil of Neroli in two ounces of Rectified Spirit, and add a few drops of it to Clarified Syrup. The real thing was slightly more tedious to make. The best fern was reputed to come from Canada, although the following instructions come from an American book. Take some good capillaire, chop it up, not so very small, put it upon a sieve, pour upon it some boiling water, and let it infuse for ten hours in a vessel well covered; strain this infusion, and put into it some sugar boiled au casse; clarify this syrup with the whites of eggs whipped; skim it till it is very clear; when it rises, take it off the fire, and leave it to cool, then put it into bottles. I am not sure how to recommend that you use these syrups – apart from in your pudding catsup. Perhaps to flavour fruit salad, or to soak pound cake? I leave it to your imagination. Rhubarb: essence of stomach ache. Ambrose Bierce. The wonderfully eccentric Dr. William Kitchener (1775-1827), author of the best-selling The Cook’s Oracle (1817) was an unusual host for the time. He actually did the cooking for his guests, or at least had a substantial hand in the cooking. He was also an absolute stickler for punctuality on the part of dinner guests to the extent that the door was locked and late guests not admitted after the appointed hour. On this day in 1826, he wrote to one of his regular guests, William Brockedon. The Honor of Your Company is requested to dine with The Committee of Taste, on Monday May 22nd. The Specimens will be placed upon the table at Half past Five o’ Clock precisely, when the Business of the Day will immediately commence. Gourmands. These are so composed, as to be as agreeable and useful to the stomach, as they are inviting to the appetite; nourishing without beiug inflammatory, and savoury without being surfeiting. Dr. Kitchener was as much a stickler for accuracy and organisation in the kitchen as he was about punctuality for guests. He was, as his frontispiece suggests, keen on ‘essences’ and pre-prepared powders, and invented the Magazine of Taste to keep them handy for use. He described it as a “Mahogany sauce box, with four eight ounce bottles, sixteen four ounce bottles, and eight two ounce bottles” and gave a diagram to show the position of the contents. There was no agonising over which one of these to give you. One does not normally see ‘pudding’ immediately followed by the word ‘catsup’. An excellent idea to keep on hand nonetheless, in case you have a pudding emergency. Half a pint of brandy, a pint of sherry, An ounce of mace, And half an ounce of cloves. Let them steep for fourteen days, and then strain it, and add half a pint of capillaire*. This will keep for years, and added to melted butter, is a most delicious relish to puddings, and many sweet dishes. *A syrup or infusion of maidenhair fern or one flavoured with orange-flower water, and to be explored more fully tomorrow. For more of Dr. Kitchener’s very amusing ideas, see the following blog stories. Chili, or Cayenne Wine, and Essence of Allspice for Mulling of Wine. Mock Arrack and Mock Mock Turtle Soup. Blessed be he that invented the pudding - to come in pudding time is to come to the most lucky moment in the world. Francois Misson, French visitor to England in 1698. Yesterday’s post stimulated a little email feedback on the topic of liver – and the tone was not enthusiastic. Offal-phobes seem more inclined to voice their phobias than liver-philes do their philes (?). I am not sure why this is, but am pretty sure that even liver-haters will enjoy the story of why liver in Italian is called fegato. Fegato comes from the Latin word ficatum, meaning figs – and an entire culinary story is encased in that one word. For at least two and a half thousand years humans have fattened geese on figs specifically for the purpose of enjoying their fat livers (foies gras if you like). So, the figs became livers lingistically as well as biologically. Nice, isnt it? Liver is one of the few foods that has a place at each end of the luxury spectrum. It is usually cheap offal, not rationed even in wartime (which I don’t understand as each beast has only one liver but four limbs, so surely should be more scarce?) – and it is also, in the form of goose or duck foie gras, one of the most indulgent. Liver is also highly nutritious, with a long history of medicinal use – raw even, for anaemia, and in the form of cod-liver oil for just about anything, if you grew up in post-war England. Here is an ancient Roman recipe from Apicius to tempt you. Fig-fed pork liver (that is, liver crammed with figs) is prepared in a wine sauce with pepper, thyme, lovage, broth, a little wine and oil. And a not-so ancient, less tempting idea for those haddock livers you have lurking in the depths of your freezer. At least it sounds marginally more appetising way to get your fish oil than off a spoon. Make a paste with some oatmeal and butter, form it into a dumpling, and place a haddock’s liver in the middle, well seasoned with pepper and salt; it should be boiled in a cloth. The best thing about liver is how virtuous it makes you feel after you've eaten some. Fried onions: the smell of hot fat, caramelised sugar, and osmazome/umami. Resistance is futile – biology says so. We are programmed to salivate at the smell and seek out the source. There are always a few kill-joys around however, so let us get their opinions out of the way before we get on and enjoy some historic recipes for fried onions. Fried Onions with Parmezan Cheese. Pare six large mild onions, and cut them into round slices of half an inch thick. Then make a batter with flour, half a gill of cream, a little pepper, salt, and three eggs, beat up for ten minutes; after which add a quarter of a pound of parmezan cheese grated fine and mixed well together, to which add the onions. Have ready boiling lard; then take the slices of onions out of the batter with a fork singly, and fry them gently till done and of a nice brown colour. Drain them dry, and serve them up placed round each other. Melted butter with a little mustard in it to be served in a sauce boat. Fried Potatoes, Apples, and Onions. till brown, occasionally stirring them. Fry sliced pleasant tart apples, and onions, in the same manner. Thus prepared, they make a cheap, plain, and good dish. The potatoes may be cut in shavings, like apple-parings, if preferred. Any dish containing both potato and cheese has got to be good, right? Instead of potato AND cheese, how about ‘potato cheese’? Potato cheese is just what it sounds like – cheese made with the inclusion of potato. Cant be bad, can it? I only discovered this concept recently, although it is apparently moderately old – and I have yet to actually try it. If you know anything about it, do please let us all know via the comments. In the meanwhile, here are my scattered gleanings on the topic. There are a number of references in English writings of the nineteenth century to ‘potato cheese’ from Germany or the Savoy region. Some recipes sound more like a fermented cheesy potato pancake rather than a potatoey cheese. Potato Cheese.—In many parts of Saxony, cheese is made in the following manner from potatoes :—Take the best potatoes and boil them ; when cold, beat them in a mortar into a pulp, adding a pint of sour milk to five pounds of potatoes. Keep the mass covered for three or four days, aud then beat it again. Make it into small cheeses, which are to he placed in baskets, to let the superfluous moisture escape. Dry hem in the shade, and then pile them on each other for fifteen days ; after which they may he put away in any manner in a dry place. They have a very pleasant flavour, and will keep good for years, improving with age. A recipe from The American Frugal Housewife (1838) by Lydia Maria Child. Potato cheese is much sought after in various parts of Europe. I do not know whether it is worth seeking after, or not. The following is the receipt for making : Select good white potatoes, boil them, and, when cold, peel and reduce them to a pulp with a rasp or mortar ; to five pounds of this pulp, which must be very uniform and homogeneous, add a pint of sour milk and the requisite portion of salt; knead the whole well, cover it, and let it remain three or four days, according to the season ; then knead it afresh, and place the cheeses in small baskets, when they will part with their superfluous moisture ; dry them in the shade, and place them in layers in large pots or kegs, where they may remain a fortnight. The older they are, the finer they become. “In Savoy, an excellent cheese is made by mixing one of the pulp of potatoes with three of ewe milk curd, and in Westphalia a potato-cheese is made with skimmed milk. This Wesphalian cheese, while in the pasty state, is allowed to undergo a certain extent of fermentation before it is finally worked up with butter and salt, and made int shapes and dried. The extent to which this fermentation is permitted to go determines the flavour of the cheese. Potato cheeses are very highly esteemed in Germany; they can be made of various qualities, but care must be taken that they are not too rich and have not too much heat, or they will burst. Boil the potatoes till they are soft, but the skin must not be broken. The potatoes must be large and of the best quality. When boiled, carefully peel them and beat them to a smooth paste in a mortar with a wooden pestle. To make the commonest cheese, put five pounds of potato paste into a cheese-tub with one pound of milk and rennet; add a sufficient quantity of salt, together with caraways and cumin seed sufficient to impart a good flavour. Knead all these ingredients well together, cover up and allow them to stand three or four days in winter, two to three in summer. At the end of that time knead them again, put the paste into wicker moulds, and leave the cheeses to drain until they are quite dry. When dry and firm, lay them on a board and leave them to acquire hardness gradually in a place of very moderate warmth; should the heat be too great, as we have said, they will burst. When, in spite of all precautions, such accidents occur, the crevices of the burst cheeses are, in Germany, filled with curds and cream mixed, some being also put over the whole surface of the cheese, which is then dried again. As soon as the cheeses are thoroughly dry and hard, place them in barrels with green chickweed between each cheese; let them stand for about three weeks, when they will be fit for use. Made in Thuringia from sour cow milk with sheep or goat sometimes added. "The potatoes are boiled and grated or mashed. One part of the potato is thoroughly mixed or kneaded with two or three parts of die curd. In the better cheese three parts of potatoes are mixed with two of curd. During the mixing, salt and sometimes caraway seed are added. The cheese is allowed to stand for from two to four days while a fermentation takes place. After this the curd is sometimes covered with beer or cream and is finally placed in tubs and allowed to ripen for fourteen days. A variety of this cheese is made in the U.S. It is probable, however, that it is not allowed to ripen for quite so long a period as the potato cheese of Europe. In all other essentials it appears to be the same." Is this cheese still made anywhere in the world? Perhaps some German speakers might be able to shed light on it? I would love to know more about its history, and I am sure many of you would too. Goat cheese ... produced a bizarre eating era when sensible people insisted that this miserable cheese produced by these miserable creatures reared on miserable hardscrabble earth was actually superior to the magnificent creamy cheeses of the noblest dairy animals bred in the richest green valleys of the earth. Russell Baker. Russian salad is the puzzle of the day today. It did not start out as a puzzle, it started out as one of the dishes served to the King and Queen, and the Duke and Duckess of York on this day in 1924 – and I thought it was about time I gave you another historic menu. The royals were making an ‘informal inspection’ of the palaces at the British Empire Exhibition being held at Wembley – the Palaces of Industry, Engineering etc that is. After four hours of touring the exhibits ‘almost as precisely as ordinary visitors do’, they were allowed a luncheon break before continuing their inspection. Les côtes d’agneau double grillées. Les petits pois frais à l’Anglais. Les canetons à la gelée d’orange. La salade à la Russe. All things Russian were still quite fashionable at the time of this menu, and some of you will know the final dish - the Strawberries Romanoff – from the 70’s, when it had a second brief reign as the dessert at pretentious tables. The prevailing theory of Russian Salad (via Wikpedia and The Rest) is that it was invented in the 1860’s by a French chef called Lucien (or it might have been Jacques) Olivier who served it in his restaurant in Moscow (or it might have been Germany), and the said Lucien or Jacques may or may not have been at some time in the employ of the Tsar. The ‘Olivier’ bit is probably correct as the same salad is called ‘Salade Olivier’ in some parts of the culinary world. The dish consists of a very variable mix of vegetables and meat (the exact composition being in a constant state of improvement and adjustment depending on available and affordable ingredients), bound by a dressing whose original recipe went to the grave with M. Olivier. The puzzle comes because, if the dish was invented in the 1860’s in Russia (or Germany), how come it was on the menu at the Inauguration ball of President James Buchanan in Washington in 1857? I have not, so far, found an earlier mention, but there may well be one. A reinforcement of the puzzle is that there is a recipe for Russian Salad in an English cookbook of 1863 – an awfully short time for it to appear in such a book if it was only just invented and the recipe was a secret. The book is The Cook’s Guide and Housekeepers and Butler’s Assistant, by the one-time chef for Queen Victoria, Charles Elmé Francatelli. This is composed of cooked carrots, beetroot, parsnips, either punched or scooped in shapes, or merely cut in neatly-formed squares or oblongs; to these add common gherkins also cut, a few capers, some scraped horseradish, lobster or prawns, or ham, or any kind of meat cut up in small squares; season with mayonaise, vinegaret, or Tartar sauce; and when dished up either in a bowl or in an aspic, or cold vegetable border, garnish the surface of the salad with very small round balls of Russian caviare, to be obtained at Crosse and Blackwells, Soho-square. The history of Strawberries Romanoff (as distinct from the myth-tory) is as yet unclear to me due to a serious shortage of research time. It is a dish worthy of return to the limelight however, so I give you a recipe from The Times in 1939. Hull 2 lb. berries: put them in a basin and sprinkle them with orange juice and curaçao: allow to macerate on ice for some time. Then place them in a serving dish, surrounded by ice, and cover with Crème Chantilly. Whip half pint thick cream and one white of egg till stiff, adding 1 ½ oz. sugar and a little vanilla if liked. Put this in a piping bag with fluted pipe, and completely mask the berries. To make a good salad is to be a brilliant diplomatist -- the problem is entirely the same in both cases. To know exactly how much oil one must put with one's vinegar. Oscar Wilde.